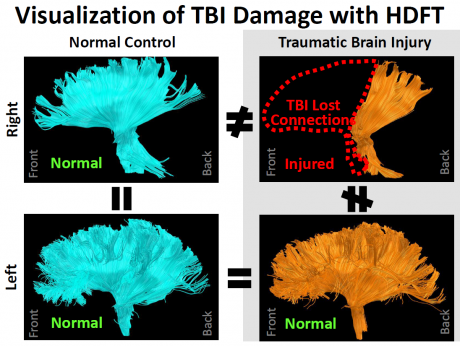 The image shows HDFT connections of a TBI patient in an ATV accident that resulted in loss of left hand function. This shows the axon field for the major brain cable or tract which controls motor function and connects cortex with lower brain stem function. The red outlined region (upper right) shows where the connections can no-longer be found after the accident. You can compare both sides to see the marked contrast. The lower images show a normal control person, demonstrating the typical high left to right hemisphere symmetry. The right images have been flipped horizontally to allow easy comparison of the shape between the left and right sides projection fields. Email this HDFT page to a friend.